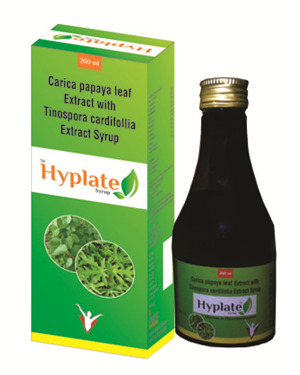 Combination of carica papaya leaf extract and tinospora cardifolia extract plays an important role in fighting against oxidative stress and immune-modulation. Combination of carica papaya and tinospora cardifolia is effective for the treatment of dengue and improves platelet counts. Effective herbal remedy for the control and prevention of dengue fever by increasing platelets in significant manner and lower down the body temperature. An important and very popular plant of ayurvedic system of medicine to improve intelligence, memory and higher mental functions. Provides highest hepatoprotective activity with strong immunomodulatory activity. Blosters host defense with proven efficacy in immunocompromised conditions. Significantly accelerates the rate of increase in platelet count among patients with dengue fever and dengue haemorrhagic fever. Effective in dengue patients by elevating the total white cell counts,platelet counts and recovery without hospital admission. A nutritional supplement with purported ability to rejuvenate the body condition and to increase energy.